The Center for Machine Learning is housed in the Department of Computer Science within the Erik Jonsson School of Engineering and Computer Science at the University of Texas at Dallas. Our mission is to foster excellent research and development of machine learning algorithms motivated by challenges from real work domains ranging from precision health to natural language understanding, from biology to social network analysis and from vision to mobile health. Our core team consists of researchers whose expertise lie in relational models, probabilistic modeling, combinatorial optimization, active learning, logic-based learning, human-in-the-loop learning, reinforcement learning, supervised learning and data mining. The research emphasis of the center implies it is synergistic with the Human Language Technology Research Institute and the Cyber Security Research and Education Institute. Furthermore, the center will promote outreach and educational activities in machine learning and AI, such as a summer school for students from other universities who are interested in this area. The Center for Machine Learning will lead many professional development and outreach activities that include, but are not limited to, a summer school, a yearly workshop, and community outreach events. The center will aim to obtain an NSF REU funding site award for machine learning and AI. The center will coordinate with the department outreach to foster relationships with local schools and colleges to advance the machine learning education. For more information on outreach activities, click here. The Center for Machine Learning will benefit from the department’s support and a potential return on overhead from grants. For more information on the Center for Machine Learning’s funding, click here. 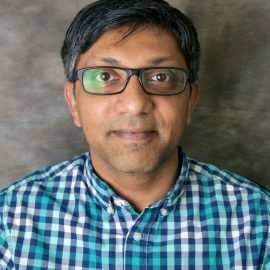 Dr. Vibhav Gogate is an Associate Professor in the Computer Science Department at the University of Texas at Dallas and co-director of the Center for Machine Learning. He got his Ph.D. at the University of California, Irvine in 2009 and then did a two-year post-doc at the University of Washington. His research interests are in artificial intelligence, machine learning, and data mining. 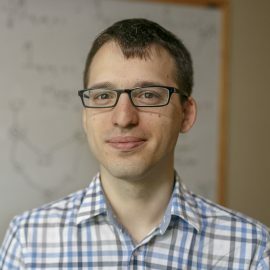 His ongoing focus is on probabilistic graphical models, their first-order logic based extensions such as Markov logic and probabilistic programming. He is a recipient of the National Science Foundation (NSF) CAREER award and the co-winner of 2010 and 2012 UAI inference competitions. Dr. Nicholas Ruozzi is an Assistant Professor in the Department of Computer Science at the University of Texas at Dallas. He was previously a postdoctoral researcher and Adjunct Professor at Columbia University and a postdoctoral researcher at Ecole Polytechnique Federale de Lausanne (EPFL) in Lausanne, Switzerland. He obtained his Ph.D. at Yale University. His research interests include statistical machine learning, probabilistic graphical models, approximate inference and learning, and optimization. His work has been funded by the National Science Foundation (NSF) and the Defense Advanced Research Projects Agency (DARPA). 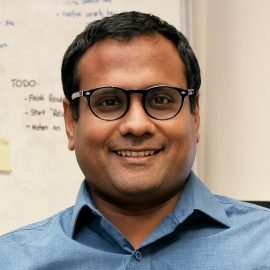 Dr. Sriraam Natarajan is an Associate Professor at the Department of Computer Science at the University of Texas Dallas and director of the Center for Machine Learning. He was previously an Associate Professor and an Assistant Professor at Indiana University, Wake Forest School of Medicine, a post-doctoral research associate at the University of Wisconsin-Madison and had graduated with his Ph.D. from Oregon State University. His research interests lie in the field of Artificial Intelligence, with emphasis on Machine Learning, Statistical Relational Learning and AI, Reinforcement Learning, Graphical Models and Biomedical Applications. He has received the Young Investigator award from US Army Research Office, Amazon Faculty Research Award, XEROX Faculty Award and the IU trustees Teaching Award from Indiana University. He is an editorial board member of MLJ, JAIR and DAMI journals and is the electronics publishing editor of JAIR. 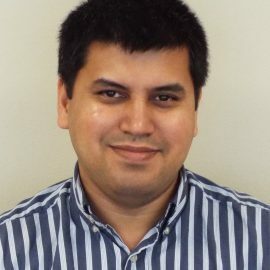 Dr. Gautam Kunapuli is a Research Associate Professor with the Department of Computer Science at The University of Texas at Dallas. He is the currently the co-supervisor of the STAtistical Relational LearnING (Starling) Lab at UT Dallas along with Dr. Sriraam Natarajan. Dr. Kunapuli received his Ph.D. in Mathematics from Rensselaer Polytechnic Institute (RPI), Troy, NY, in 2008 under the supervision of Kristin P. Bennett and Jong-Shi Pang. From 2013–2017, Dr. Kunapuli was Senior Research and Development Scientist at UtopiaCompression Corporation (UC. From 2008–13, he was a Postdoctoral Research Associate at the University of Wisconsin-Madison under the supervision of Jude W. Shavlik and C. David Page Jr. He has over ten years of experience in machine learning and optimization in both industry and academia, with focus on knowledge-based and advice-taking learning algorithms, scalable learning algorithms for Statistical Relational Learning, Learning with Autonomous Agents and Domain Adaptation.